Spacious home on almost 2 acres featuring an in-law suite and potential for business use! 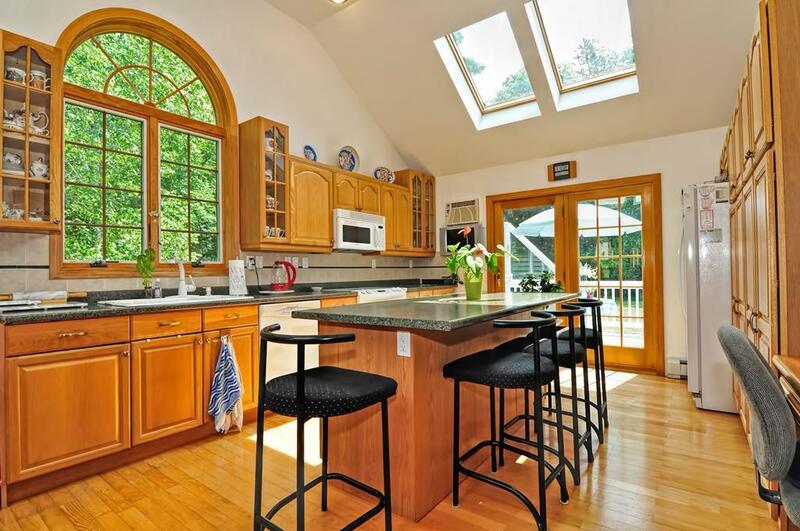 Eat-in kitchen boasts cathedral ceiling, skylights, center island & slider to composite deck. French doors lead to the large living room. First floor master bedroom features en-suite bathroom & slider to deck. Upstairs, extended family or guests will enjoy their own full kitchen, dining/living room, full bathrooms, and bedrooms. Third floor landing makes a nice office or reading space. 2000 sq ft partially finished basement lends big potential! Approx 1100 sq ft was previously used for business and has separate entrances - perfect to transform for your business needs or perhaps for hobbies such as a gym or media room. Enjoy bragging rights to your own sauna! Ample closet and storage space throughout. Plenty of parking. Level backyard with privacy. Enjoy your blueberry harvest in the summer. Great for multi-generational living. Bring your ideas & come see how this property can make them reality! Listing courtesy of Megan Hall of Keller Williams Elite. Disclosures Subject To Finding Suitable Housing. Industrial Zoned Houses in immediate Area Current Use is A Single Family Residence. Utility Easement. Exclusions Personal Belongings. Dining Room Chandelier. Washer/Dryer And Curtains Negotiable. Listing provided courtesy of Megan Hall of Keller Williams Elite.